The drive behind mint is rooted in the growing demand for traceable and sustainable natural mint, while developing new innovations in sensory research and a more refined understanding of regional preferences. Pictured here is M. pulegium—grown in Rutgers University’s mint greenhouse—which produces an undesirable flavor and aroma, but contains natural repellant properties. Unusual varieties like M. pulegium offer a chance to cross-breed with tastier and disease-resistant varieties. “The world will rediscover mint,” says Patrice Merceret, master flavorist, Firmenich. Its popularity in consumer goods, particularly in oral care, is expanding into new product innovations with unique flavor profiles, sensory technologies and functional aroma chemicals. In fragrance, mint offers a green and herbal quality to formulations, while imparting a cool, crisp and refreshing scent profile. The rise of aromatherapy has seen a boom in peppermint oil due to its perceived calming effects. Mint’s popularity is also a testament to its benefits. The Instagram hashtags #mint and #mintflavor boast 5.2 million and over 4,000, respectively – indicating how consumers, brands and suppliers showcase its potent freshness across a range of products in food, beauty/personal care and fragrances. The drive behind mint is rooted in the growing demand for traceable and sustainable natural mint, while developing new innovations in sensory research. Local sourcing and ingredient production through 2020a will continue to influence consumer purchases that promote a cleaner, more sustainable environment. According to Mintel’s market data reportb, 50% of UK consumers look for products made with natural ingredients when purchasing beauty products. In Germany, 25% of consumers purchase natural/organic products because of the belief that its better for the environment. Today mint essential oils are derived from conventional species like Mentha piperita, Menta spicata, Menta cardiac and Menta arvensis. "The most preferred variety around the globe is certainly M.piperita," explains Mélanie Vanberghem, director, global category oral care, Firmenich. The company partnered with Essex Laboratories to develop non-GMO piperita varieties with new signatures and tonalities. Despite the push for breeding new varieties, including the newly added FEMA GRAS water leaf mint extract, "plants grown with better properties will help drive mint growth," explains Steve Pringle Ph.D, vice president global mint and Sensatea group, Takasago. With climate change affecting crop variability and price, breeding mint varieties that offer new and stronger signatures and tonalities may contribute towards a consistent mint market, especially for American peppermint threatened by the verticillium wilt disease. Affecting most of the global mint harvests (except for reported resistance in native spearmint, Mentha spicata) symptoms of wilt disease exhibit yellowing, twisting and curling of the upper leaves.1 These new varieties will “open new sustainable avenues with lower needs of water, fertilizer and pesticides,” explains Merceret. Rutgers University’s greenhouse in New Brunswick, NJ contains hundreds of varieties of mint that are being used to study disease resistance, particularly powdery mildew and verticilium wilt. Thomas Gianfagna, professor, Department of Plant Biology explains that "commercial species of mint such as spearmint (Mentha spicata L. ) contain multiple sets of chromosomes making genetic mapping more difficult when it comes to understanding disease resistance." Disease resistant varieties of spearmint may be developed by studying the parent species, Mentha suaveolens and Mentha longifolia. Mint’s large genetic variability offers researchers to breed varieties that will produce valuable compounds for commercial use. Typically, hybrids consist of four to five basic mints. The more variability, the less likely a plant will be affected by disease in the field. Gianfagna adds that "metabolic pathways can tell us which compounds will be useful in commercial production. Depending on a mint variety’s metabolic pathway, the compounds that are produced may have an undesirable flavor and aroma, but contains other beneficial properties, such as insect repellant." In the case of M. pulegium, commonly known as pennyroyal, for example, its pathway is on the way to produce menthol (a desirable flavor and aroma), but instead stop at pulegone. This unusual variety can then be crossed with a tastier mint that’s resistant to disease. Among natural and organic claims, wellness continues to drive consumer preferences in both emerging and developed markets. By 2025, the global oral care market is expected to reach $40.92 billion with a CAGR of 4.8%c. In emerging markets, particularly Asia Pacific and India, growth is attributed to a rise in dental hygiene awareness and rising incomes. In 2016, toothpaste was a booming category within the segment due to an increase in the variety of functions and flavors. Growth in developed markets is influenced by new innovations in multifunctional products and unique flavor combinations. Europe is expected to experience significant growth due to a growing geriatric population and a rising importance placed on tooth decay prevention with the regular use of products such as mouthwash, dental floss and mouth fresheners. In 2016, toothpaste was a booming category within the segment due to an increase in the variety of function and flavors. “There is a lot of flavor innovation in oral care,” explains Pringle, “Whether this is in varieties of mint flavor which are being created or varieties of synergistic flavors such as citrus, herbal and floral combinations with mint.” Among flavor innovations, sensory cuing—products that impart a sensation—and malodor technologies that eliminate odor-causing aroma chemicals, are being used creatively to impart a sense of cleanliness and freshness. Currently, the Americas are driving the oral care growth with 42.56% market shared. The top segments include toothpaste, toothbrushes, mouthwash/dental rinse, dental floss, denture care, tooth whiteners and mouth fresheners. As the fastest growing oral care category, mouthwash offers a quick way to kill bacteria. A major revenue generator in 2016, with 45.3% share, mouthwash, particularly flavored and herbal mouthwashes, offered an opportunity for manufacturers to differentiate themselves from others on the retail shelves. Retail outlets are also another factor in driving oral care growth. By 2021, the retail outlets, including supermarkets, hypermarkets and health & beauty retailers, will hold 58.78% of the oral care marketd. Global growth in oral care will be attributed to sensory technology, premiumization and ingredients. Functionality versus total care is currently pushing innovations in developed markets, where consumers are looking for specific attributes to offset particular dental problems (i.e. plaque, tartar control, cavity protection, whitening and sensitivity). Mint’s condition in the market is driven by a combination of breeding stronger varieties and sensory technologies. 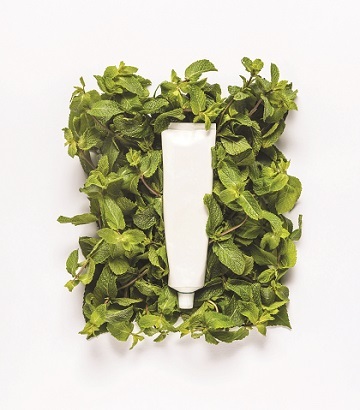 Though regional preferences expect different facets of mint’s benefits in oral care products, it’s clear that the perception of cleanliness and refreshment are consistent baselines of innovation for the market’s growth and success. b Sensate is a registered tradename of Takasago.